Gregangelo & Velocity Circus is a San Francisco-based arts & entertainment group that employs high skilled variety artists, visual artists, and circus artists on the regional, national, and international special events, corporate, and touring markets. Gregangelo & Velocity Circus provides hi-impact spectacle acts, characters, unusual visual arts, dancers, antics, and shows tailored to audiences worldwide. The company’s signature aesthetic fuses various elements from ancient, contemporary, and futuristic World Cultures, Dance, Circus Arts, Visual Arts, Science, Astronomy, and more. 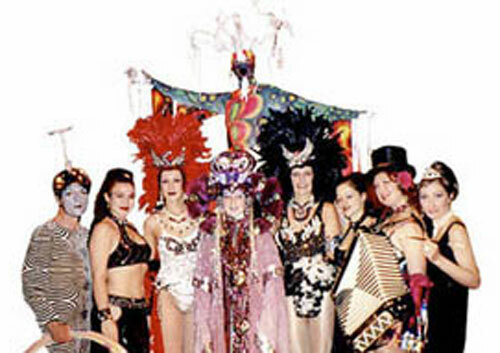 Our vast Arts & Entertainment services, Museum quality costumes, and Original Acts and Artists are commissionable into ANY theme or venue. Gregangelo & Velocity Circus Troupe are masters in providing Hi-Impact and Uncommon World Class Entertainment for Fairs & Festivals and any Special Engagement (Corporate, Convention, Trade Show, Product Launch, Branding, Team Building Instruction, Fund Raiser, Gala, Night Club, Media, Print, Children’s, Etc.) Bay Music can offer their Touring Shows, Acts, and Characters for public venues including Walk-Around and Buskers. All of their artists dedicate their livelihoods to perfecting their remarkable and unusual artistry & skills. Their phenomenal stage acts are the artists’ lifetime achievements. This entry was posted in Dinner Shows. Bookmark the permalink.